Welcome to my in home preschool. I am so happy to show you around! At the end I’ll send you off to some more amazing classrooms and spaces too. I am a former preschool classroom teacher and administrator of 10 years turned into a work at home preschool teacher, and I’ve been teaching from my home for three and a half years. I took the leap to my home once my second child was born. If you’ve been thinking of starting your own in home preschool program or daycare, here is some fantastic information about how to open your own program! 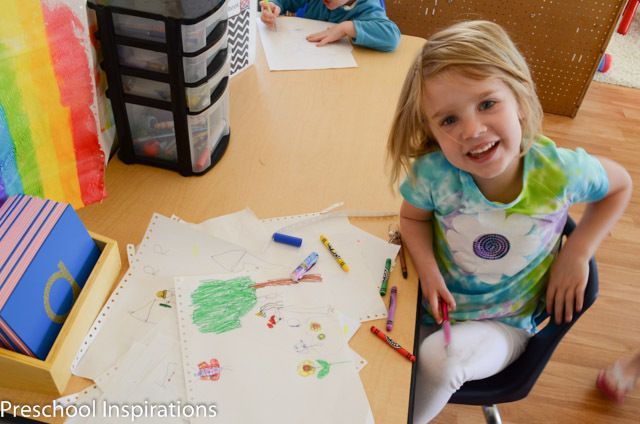 I also have some awesome tips on how to choose a preschool curriculum. My program started as a full time child care program with children from infancy to five and has become a four day preschool program with kiddos who are three to five-years-old. 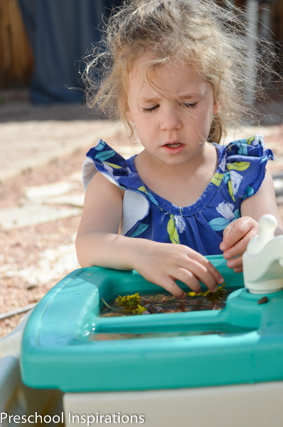 I have a classroom that is used exclusively for preschool and homeschooling my kindergartener, which is a living room that is tucked at the back of our home in Colorado. You’ll notice that I blend multiple learning domains into all of the main learning centers. There are math and science activities in home living, literacy in block area, and even dramatic play in our outdoor play area. I also use several different philosophies in my teaching and environment: traditional, Montessori, Reggio, and I’ve starting adopting some Waldorf as well. Every child in my program has a different learning style, so I love to incorporate and personalize many of our activities and centers to help each one succeed. My in home preschool classroom is loaded with items that are small enough to be choking hazards. 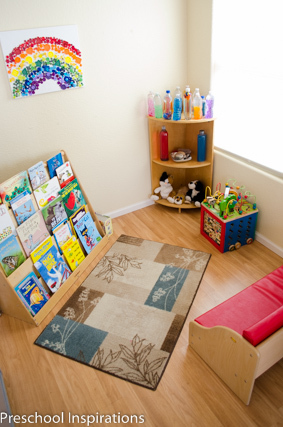 Close supervision is provided as well as consideration of each child’s oral sensory needs. The largest area that we have is home living. 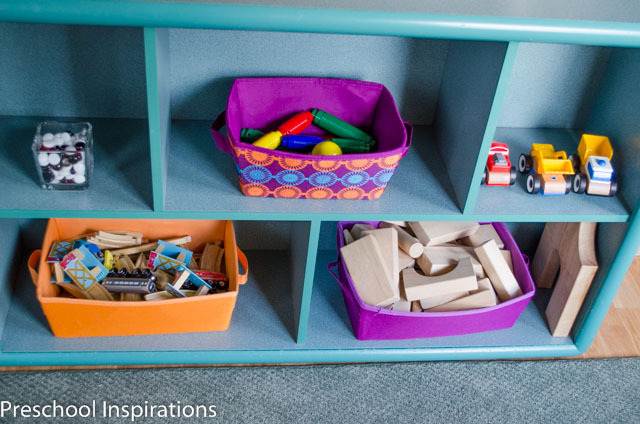 It has our typical dramatic play elements as well as a dollhouse, practical living items, sensory items, and lots of math items that I never intended on being in here. For the longest time, I kept finding items that a child had brought from another area. 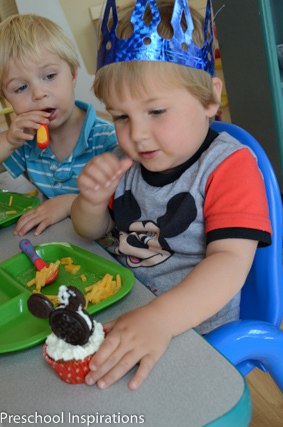 There were counting bear cookies, stacking cups for tea parties (in addition to the intended cups, bowls, etc. ), sensory bottles for cocktails (virgin of course), and more. I decided that if the class wanted those items in this area so desperately, I would just permanently move them there. This is one of our tea parties. And for the record, we don’t always have China in here! For the longest time, our dramatic play area was crazy out of control. The clothes, costumes, hats, shoes, accessories were out of place all the time. I found a wardrobe from IKEA, and it has been my best home living purchase ever! Now my class has a space for it that has some sort of organizational flow, and the older students are already awesome at hanging the outfits up! One of my favorite areas is the writing center. It is well loved. How many teachers can say that their class will draw for hours? This center is so unique because I’ve never had so many children so immersed in writing skills. It’s all been child-led too. While I am gushing about this center, I will add that it is the absolute messiest! They come and ferociously interact with the pencil, tousle the paper, then walk off beaming. When I say to go clean it up and get it ready for the next friend who will be going there, they look at me as though I’m an alien, ha. Here is where I keep some extra math and science items. We love watering plants indoors (and outdoors), so I’m always thrilled to have live plants around…even if they sometimes don’t live very long. If you are wondering what the blue and red striped rods are, those are Montessori number rods, which I absolutely can’t live without anymore. 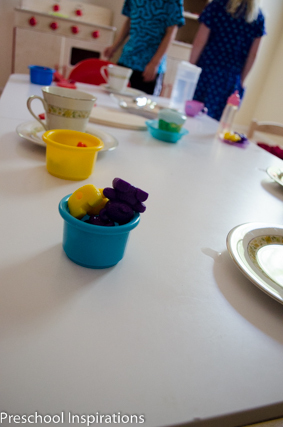 The table that we use for our meals becomes a multi-use area during our play times. 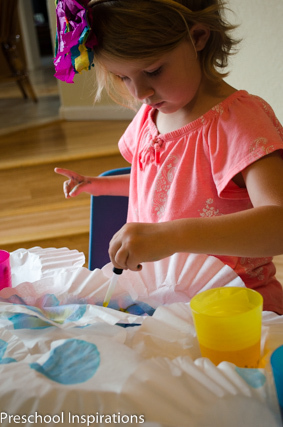 Whether it’s art, sensory play, table toys, fine motor practice, etc. it will find a purpose to serve. I especially love the special occasions such as birthday celebrations. This day it is serving as a resting place for dozen of coffee filters with watercolors. Talk about a dream activity! This is our reading area. 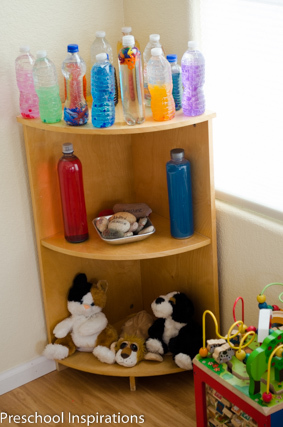 I love having books, sensory bottles, name rocks, puppets, and busy beads here. They are all objects that are favorites, and the versatility draws in lots of children who might otherwise not be as interested in it. You can read all about how we made our class button rainbow collage. We also love our calm down jars. I think they are a must-have. I have a tutorial on 6 ways to make a calm down jar. You might be really surprised with what I incorporate into block area. 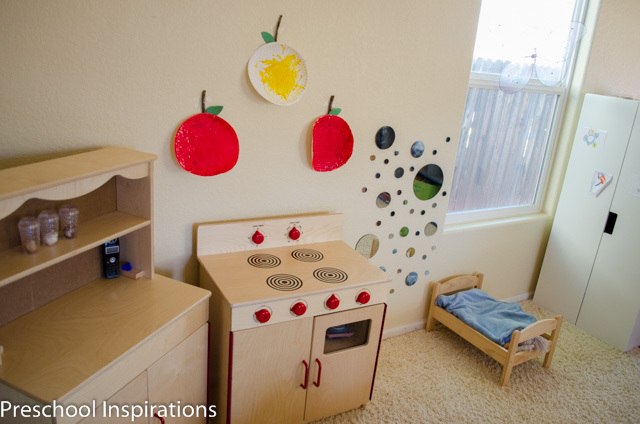 Besides blocks, this area is also great for circle time, tools, magnet play, and more. I feel that no block area is complete without items with wheels, so there is a train set in the orange basket and some super sturdy cars we found at IKEA (on the upper shelf, far right). The multicolored basket on the upper shelf has magnets to construct with, and to the left of that is our container of glass beads. Castles here are never complete without the finishing touches of glass beads. We also love to build marble towers in this area. Did you happen to notice what is on the wall? It’s four of our sandpaper letters, and they have worked perfectly here, especially when we talk about them during circle time. I love having them available on this wall all day and adding an extra literacy element in block area. My father-in-law made customized frames for them so that my class can come trace them whenever their heart desires. I know it may seem a bit bizarre, but it definitely works for us. How about a look outside? A huge part of my teaching philosophy involves spending lots of time outdoors. In the summer and fall, we really get to take advantage of this. We enjoy taking many activities outside. 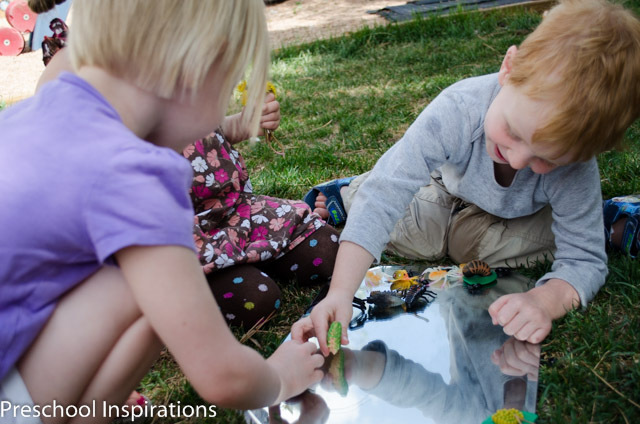 From circle time, to science, fine motor practice, sensory play, home living, and more. And of course mirrors are great here too. I’ve been saving one of the best parts for last, so I hope you love it too. One of the most unique aspects about my program is our class greenhouse! It’s truly incredible to plant a seed and to have growth appear after only a couple of days. We also love our morning snack of tomatoes, peas, strawberries, or even peppermint. Sometimes we just walk in and smell the lavender. Our class greenhouse is truly the icing on the cake in my book. Thank you so much for taking the grand tour! Have I inspired you to start your own school in your home? Here are is how you can start! Are you ready to see more inspiring spaces? I encourage you to visit my friends below by clicking on the provided links! 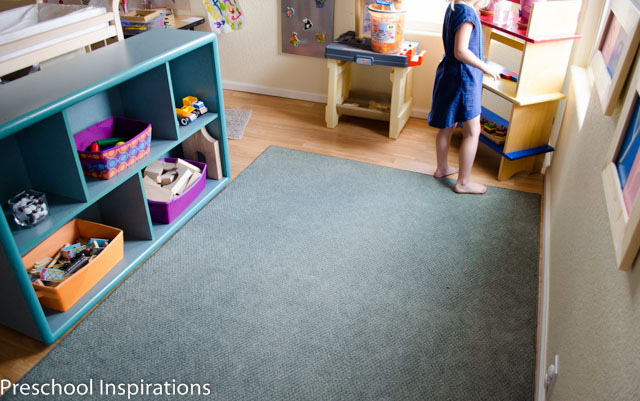 My friend Sarah has also written a great post about making a learning environment when you don’t have space for a classroom in your home at Stay at Home Educator. Your environment is so child friendly! 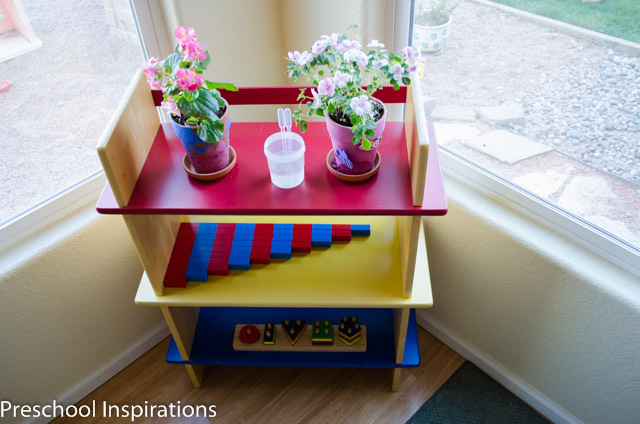 Love how you have incorporated Montessori, Very impressive! Thank you so much, Pat! It is always a work in progress with some crazy long nights rearranging sometimes, and your comment makes my heart so happy. I’m thrilled to have you stop by. Thank you so much for hosting this hop! 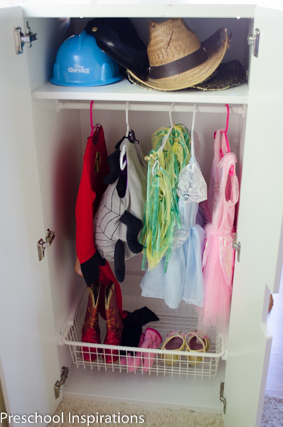 I love to see how other people organize their spaces– even if it is just a sneak peek! I am envious of your green house! You are so right about the sneak peek because our rooms have so much! And thank you so much for joining in and sharing your incredible ideas and spaces! Thank you for sharing. What an amazing use of the space. I love it all especially the writing area. The pippettes near the plant are a super idea too. Well done very thoughtful. Thank you for visiting, Lisa! I appreciate your sweet comments, and I’m so glad you enjoyed seeing my classroom :). 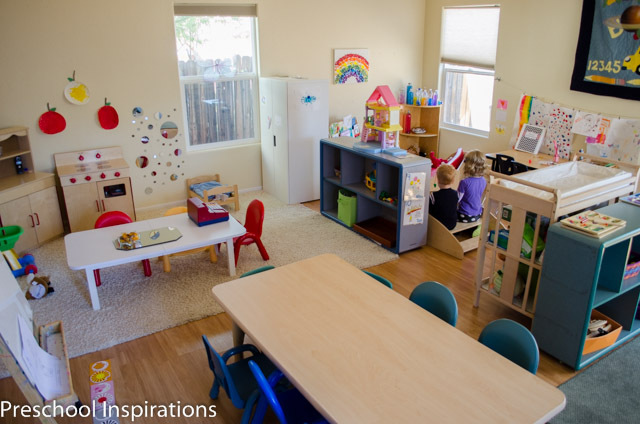 Katie – such an inspiring environment for your little ones! 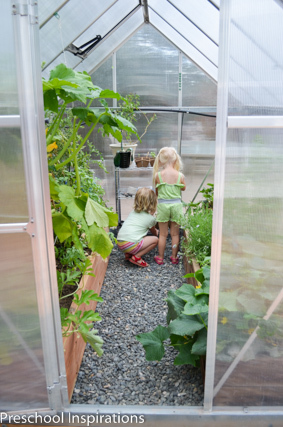 Our kids would LOVE your greenhouse! What a fantastic display of love, care, and learning! Thank you for ALL of your hard work not only for the blog hop, but for your students/kids! Great post! Darla, thank you friend! This blog hop is so fun and inspiring. I’m so thrilled you’ve been a part of it, and thank you for passing along your beautiful spaces! Thanks for sharing! I just love this. I am a former Montessori educator turned administrative professional that will be returning to my childcare roots and opening a small center in my home. This gives me so many ideas for making a great center in my small space! Your comment means so much to me, Dawn. I hope your small center goes wonderfully. It’s so nice and enjoyable to have a small group. I’m so pleased to have you visit! What are the dimensions of your room? 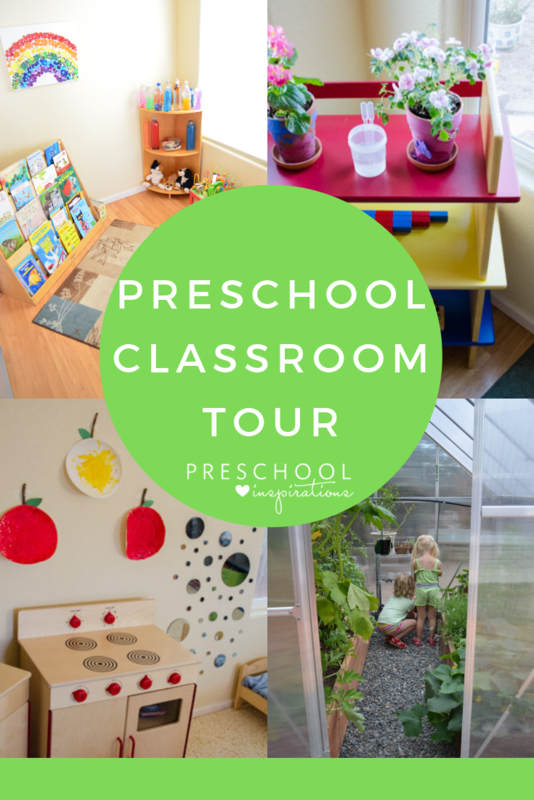 I also teach preschool in my home and the room seems to get smaller every year! Haha, Natalie. I can completely understand that one! My room is 20 feet by 19 feet. You have a absolutely beautiful preschool!! I have been looking for a preschool for my toddler here in Northern California and it has been nothing short of a major disappointment. I really really wish there were home schools like yours near to where we live. Oh Shweta, I do hope you find something you love! Sometimes great providers are a diamond in the rough. Many well wishes to you and your family! Thanks so much for sharing your space — it is beautiful! I do love your greenhouse also! How many children are in your program? You are so kind, Dee! Our greenhouse definitely has a special place in my heart! I have 6 to 7 children a day, so a nice intimate setting :). Thanks for visiting and commenting. This is so awesome, Katie!! You do such a great job — Love all your tips and visuals!! Awww, I so appreciate reading this Robyn! We sure will do coffee soon :). Love, Love, Love! I love seeing your space! I especially love the greenhouse, actually I am a tad jealous. Wonderful learning space! Thank you so much, Dayna! The greenhouse is definitely super incredible. I wish it was heated so we could use it year round :). What a gorgeous learning classroom. I love all the different areas you have created. Lovely. Thanks for sharing. That’s so nice of you to say, Kate! It’s always a work in progress :). It’s a pleasure to have you visit! I hope you are able to, Dorothy! I’m so glad I could help inspire you! 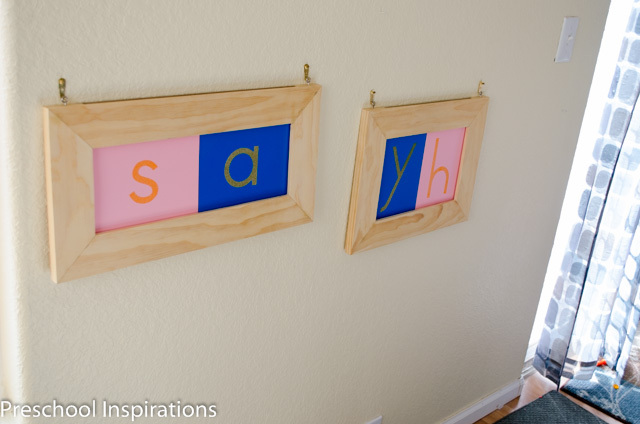 How did you make the sand letters that you had on your wall? I think they are awesome and would be great to do in our pre-school! Thanks for all your wonderful ideas, they are so helpful! We just love them, Patti! I actually bought them on ebay from this store. I loved taking a virtual tour of your classroom! All of the natural light makes it so bright and inviting! 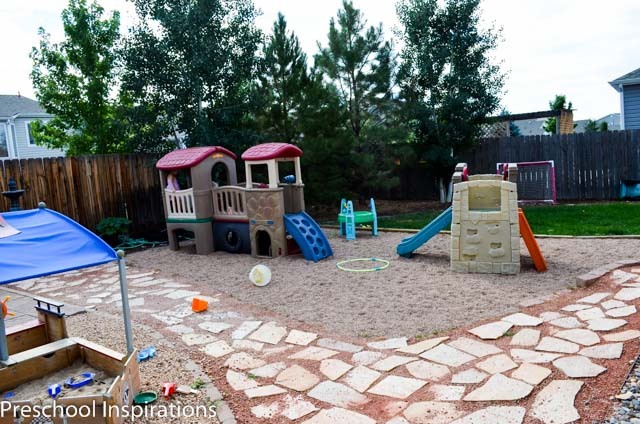 Your outdoor play area and greenhouse have me drooling. What an awesome learning experience for your kiddos. I hope you have a great school year. Thank you so much, Jamie! We do love it, and it’s definitely been a work in progress! A little bit here and there each year, with lots of slave labor from my husband and father-in-law :). I appreciate the sweet comment! Thank you for sharing. I love the centers you have created. Thank you so much, Diane! After doing some digging, I found out that our greenhouse is called Palram Nature Series Mythos Hobby Greenhouse. Ours has held up really well and been a great investment. We found ours online as a kit. I hope you find the perfect one! Katie! I knew you would thrive in a daycare! Your center looks awesome! We want to come visit one day! We would love to have you come visit, Mel! I hope you and the girls are doing wonderfully :). 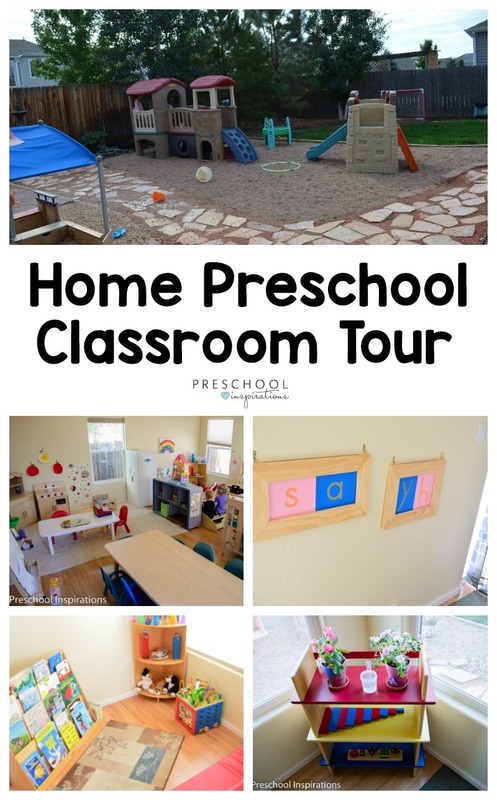 Your preschool room looks so exciting, and fun to learn. I enjoy the pictures. Thank you for visiting, Robin! I appreciate your kind words :). I’m so thrilled to hear that, Melissa! You sound like a wonderful teacher :). You are so kind! I’m glad you love it :). Best wishes for you and your program!! Wow Katie,what an amazing space,i love it,it would be fabulous to teach in. Thank you for the kind words, Stacey! Out of curiosity, what are the dimensions of your room? It is 20 feet by 19 feet. Love your space! I was just curious how many preschoolers do you have? Hello! Your classroom is so peaceful, I love it! Do you remember where you purchased the shelving units? I like the rounded edges. Thanks so much, Casey! The shelves are from Lakeshore I believe. The rounded edges are definitely nice :). Thank you so much for sharing your fabulous classroom! Are the circles on the walls mirrors? If they are, do you remember where you got them? Thank you so much! Yes, they definitely are mirrors. I got these ones from JoAnn. I think they’re at most craft stores though.